SearchHomesNW | Seattle-University District Real Estate-Easily search all University District homes and condos for sale. 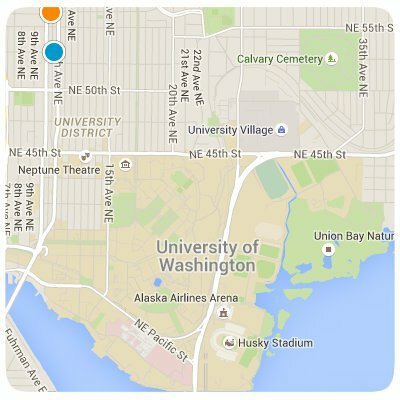 The University District is aptly named for its close proximity to the University of Washington. The neighborhood is located a short three miles away from Downtown Seattle, bordering Ravenna, Portage Bay, Interstate-5, and Lake Washington. Shopping is always convenient and exciting at University Village with many interesting restaurants like, Din Tai Fung and Liam's. The heart of the “U District” is at University and Roosevelt Way (referred to as the “Ave”) that offers shopping, dining, and entertainment to residents, students, and visitors. The restaurants are known for offering fine international cuisine and the shops sell merchandise from around the world. The U District has many opportunities to explore Museums, enjoy public art, and attend shows at Local Theaters. As is to be expected in a college town, the city never sleeps with a variety of exciting activities are happening day and night. Homes for sale in the University District vary: there are Condos For Sale In The University District, Town-Homes For Sale In The University Distrcit , and Single-Family Homes For Sale In University District. There are also many New Homes For Sale In The University District and many under construction. Thank you for using SearchHomesNW.com to find 30% more listings than Zillow, Trulia, and Realtor.